Model H, packed with technology inherited from its parent products, is the next generation of CRON CTP. 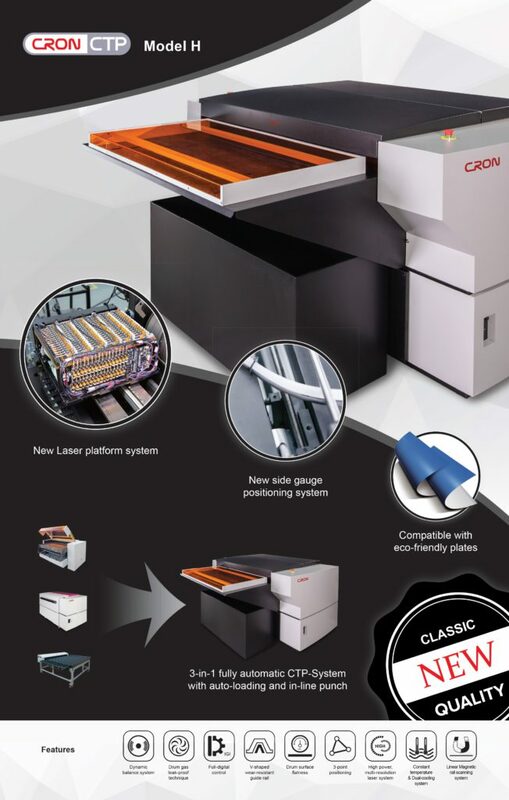 It is a fully automatic 3-in-1 integrated imaging system which aims to meet demands of the printers: compact design, ease of use, low cost of ownership, easy maintenance, outstandinf dot quality, 1∼99% dot range. Model H comes with automatic plate loading and paper removal features. Our 2-up CTP can image plate size as small as 240 x 240 mm. The built in punching enables precise registration. Available first in 26″ format, our future platform is scaleable up to VLF. At that point, it will sit proudly beside our existing line of high performance, modular CTP engines. Together they ill continue CRON’s tradition of helping printers strive towards increased margins, improved environmental responsibility, reduced waste and PRINT PERFECTION.